When you are missing teeth, your entire life is affected. Not only do simple tasks, such as eating and speaking, become difficult, you may find yourself becoming more self-conscious, and hiding your smile from the world. One of the most popular solutions for tooth loss is dental implants, which provide you with a multitude of benefits. However, dental implants aren't for everyone, and they may not always be the best option. Dental implants are small titanium rods. These rods are surgically placed into your jaw, and they fuse with the bone as the sites heal. The rods act like tooth roots, and support one or more false teeth. They also help to prevent the bone loss associated with tooth loss, preserving the integrity of your jaw and keeping it strong. While often a preferred method, implants aren't for everyone. One of the biggest, yet often ignored, issues associated with tooth loss is the deterioration of your jawbone. Without the roots of your teeth to stimulate the bone, the body begins to think that it doesn't need to send as many nutrients to the jaw anymore, and therefore reallocates those important nutrients elsewhere. As a result, the bone begins to reabsorb and the jaw begins to change shape. If you have lost too much bone mass, implants will not fuse properly, causing them to fail. 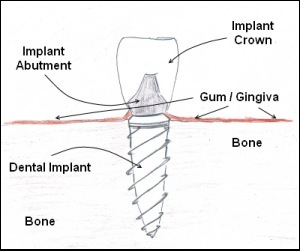 In order to be considered for implants, you may first need a bone graft. There are some health conditions which can disqualify you from being a candidate for dental implants. One issue is gum disease. Your gums need to be healthy in order to undergo a successful surgery, and prevent the risk of infection. This issue can be resolved with gum disease treatment. Other health issues are more difficult to resolve. Health conditions such as diabetes impact your ability to heal in a timely manner, which increases your risk for infection and other complications, including implant failure. Smoking has a significant impact on your overall health, including the health of your mouth. It also greatly slows healing, and therefore increases your infection risk. If you are a smoker, or are unwilling to quit for a set time before surgery as well as while you heal, you may not be a candidate for dental implants, and will need to consider another option. While dental implants are a great solution for tooth loss, they are not for everyone. Please contact our office if you want to learn more and discuss your options.